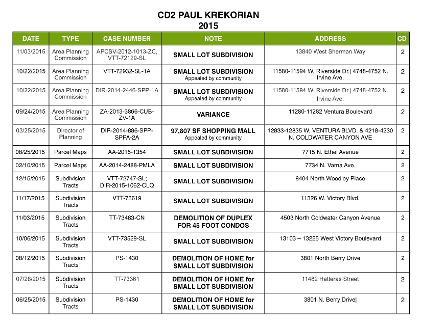 Following the footsteps of Krekorian is his Chief of Land Use KARO TOROSSIAN. TOROSSIAN recently moved to Sunland Tujunga specifically to run as a candidate for 2017 City Council Member for CD 7. 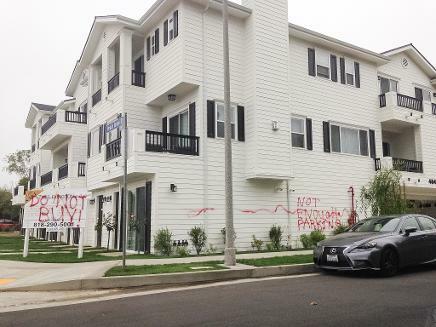 Let our experience be the lesson to show you what damage he will do to your neighborhood next. Do your research. Talk to the PEOPLE in the neighborhoods to find out their experience. Our sources notified us just yesterday of Torossian's appearance at a public hearing where he shunned the entire room of community while supporting developers with plans for another profiteering goal. YOU DECIDE IF THIS IS THE GUY YOU WANT RUNNING YOUR NEIGHBORHOOD! Let's make sure we disclose ALL the information Paul. 70%? Don't you mean 70% of the VOTERS? There were 124,508 REGISTERED VOTERS at the time of the last election. 8,312 may have voted for you, yes. . . but how many of those voters were your campaign contributors?? 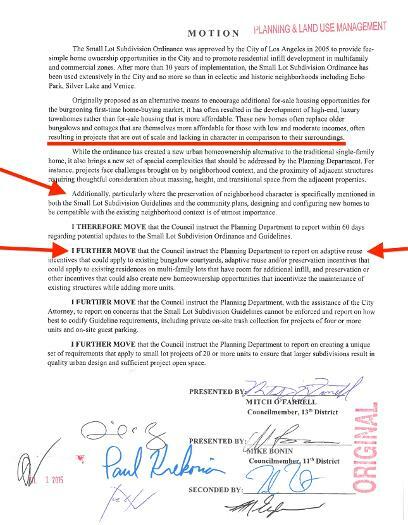 ON PAPER - ALL LOOKS GOOD FOR PAUL KREKORIAN "..problems in the implementation of the Small Lot Subdivision Ordinance have come to light. In many cases, Small Lot Subdivisions have disrupted the character of existing neighborhoods. They are not compatible with nearby buildings and do not relate well to the street." 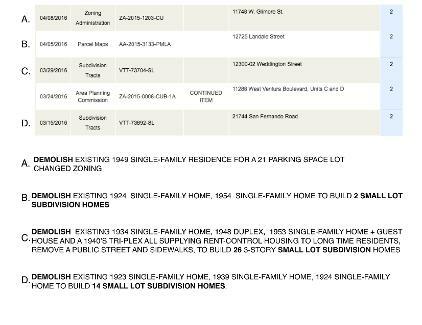 YET SMALL LOT SUBDIVISIONS AND THE DEVELOPERS HAVE HIS FULL SUPPORT. 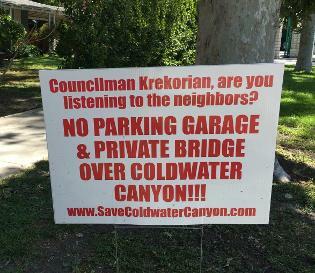 WHEN IT COMES TO NEIGHBORHOOD PRESERVATION, KREKORIAN WANTS NOTHING TO DO WITH IT. 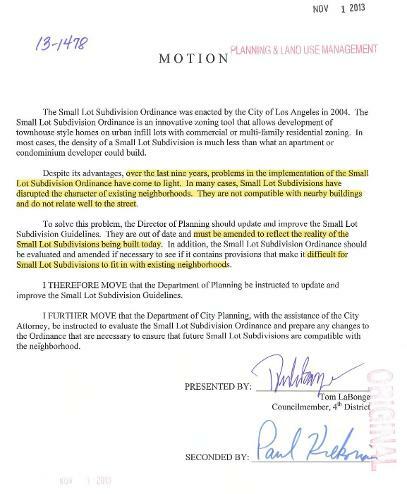 Krekorian and his Director of Planning and Land Use, Karo Tarossian, have approved every SLS request and have actively opposed the community. 11500 block of Chandler Blvd. - illegally demolished 1940's units - no compliance with asbestos or LEAD paint laws. 5300 block of Hermitage Ave. - 12 trees with juvenile birds, nests and eggs are destroyed by a Caterpillar, killing living wildlife for a Krekorian approved 4-story building; the only 4-story in the neighborhood. 12 rent-control units demolished. Huston Street - A house cited in Survey LA as being the last remaining example of Victorian Style in the area illegally demolished and replaced by a McMansion. Also destroying a 50 year old tree. Costello Ave. - Zoning deviation to allow a separation of 2 INCHES IN LIEU OF THE REQUIRED 12 FEET between buildings. Demolition of another occupied Single-Family home for more Small Lot Subdivisions by Steve Nazemi on Landale Street. Removing a public street, public parking, open space, more than 3 dozen trees and has accommodated all requests made by the developers. Another example of OUR elected official working for special interest. SIGN NOW! "...KREKORIAN became its most eloquent and articulate defender of its most preposterous policies that ignored the concerns of residents, policies that served the unions, developers, contractors and the corrupt political machine itself,..."
TAKE THIS QUICK SURVEY - LET US KNOW WHAT YOU THINK! HOW LIKELY ARE YOU TO SIGN THE RECALL PETITION WHILE SITTING IN TRAFFIC? Rolling down my window-give me a pen! ..."Yes, Krekorian has a lot to hide, because he is the political pointman for the Armenians and certainly wants to keep this activity out of the public's view and knowledge.... Paul Krekorian called me a racist, as soon as I addressed the meeting about the city government's corrupt acts supporting Armenian property owners. 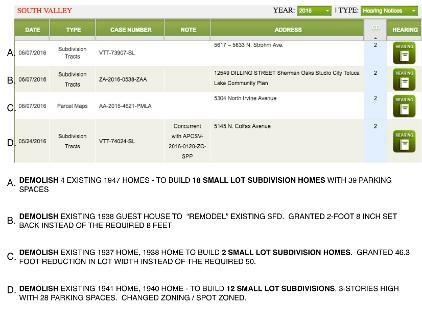 ...The LA County Tax Assessor's website for properties, never seems to have sale details for Armenian bought properties, while all other sales have a sale date and some figure for the sale price. Do you find this interesting? " ..."Utter, complete and arrogant government corruption, especially for a specific minority, putting them above the law, along with their invasion of our neighborhoods." Click on the LA TALK RADIO image below to listen to CD2 supporters discuss the Recall recorded live on April 17, 2016! 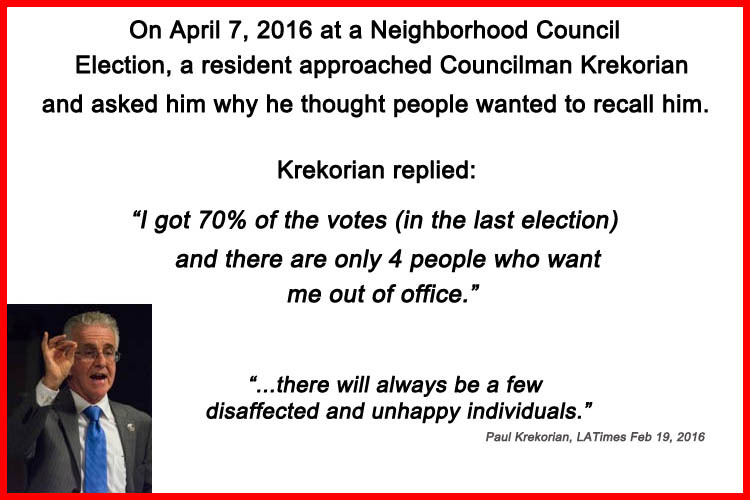 "So when it comes to Paul Krekorian...he only wants to be your City Councilman until he sees a better job open up. Then you will get the middle finger salute from him as he races off to serenade some other gullible voters in yet another district. Paul will say and do anything to get elected to any position he seeks. Voters who believe he would somehow stand up and protect their individual freedoms are sadly mistaken. 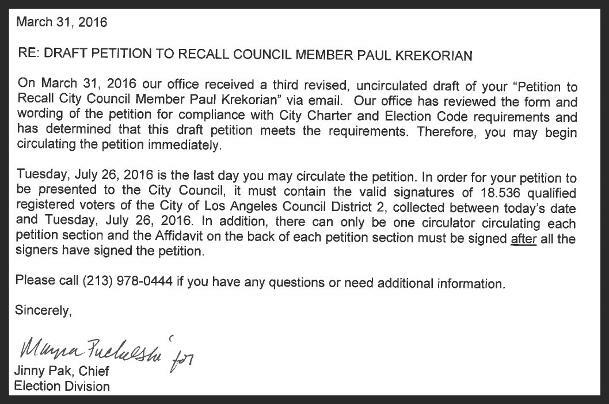 On February 29, 2016 Councilmember Paul Krekorian was officially served a Notice Of Intent To Recall. Click on the image below to view or download the official notice. 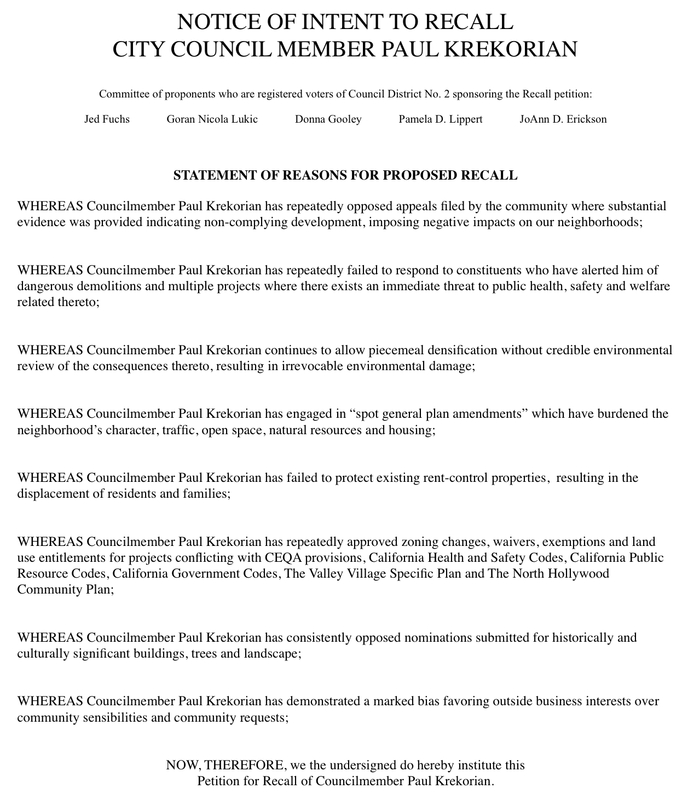 Click here to view the NOTICE OF INTENT TO RECALL COUNCILMEMBER PAUL KREKORIAN PUBLISHED IN VALLEY VANTAGE (page 12). Enter your email address below and SIGN UP to receive important updates. Someone will be in touch to provide a convenient way for you to sign the petition. THE MOST IMPORTANT THING YOU CAN DO RIGHT NOW IS TO MAKE SURE YOU ARE A REGISTERED VOTER OF COUNCIL DISTRICT 2. IT'S AS EASY AS REGISTERING HERE. Describing it as "an us-against-them campaign. The us are the group of seven self-styled grass-roots candidates looking to fill out the nearly two years remaining on the term of Wendy Greuel, following her election as city controller. They describe their opponents as the "two carpetbaggers" and "that school board member." The "carpetbaggers" are Assemblyman Paul Krekorian, D-Burbank, and former Paramount executive Christine Essel, both of whom rented apartments in the district to qualify for the ballot. The district runs from Studio City on the south to Sunland-Tujunga on the north and is among the most politically diverse and active in the city with issues ranging from overdevelopment and mansionization to preserving equestrian areas. KREKORIAN, who is assistant majority leader in the Assembly, is facing complaints that he is shopping for a new political job after years as a Burbank Board of Education member and assemblyman - and one which pays more, $179,000 compared to $115,000. He lived in Burbank, but moved into a Valley Glen apartment to qualify for residency in the district. 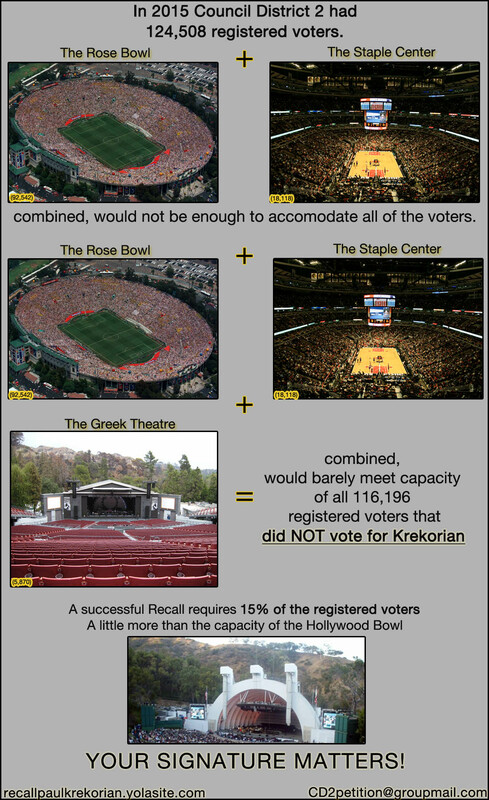 "The carpetbagging thing is a political consultant argument and not one that real people care about," Krekorian said. "The people in this district that I represent know I've been there for them, fighting for them, regardless of what my previous address has been." Krekorian said he is running for the office to deal with the sense he hears from people that the city is heading in the wrong direction. "It is failing to listen to them and not working effectively to adopt the priorities of the people of the San Fernando Valley." "What people are telling me is they are frustrated and there is a sense that the decisions are controlled by a power elite in and around City Hall - that the people in the communities, whether it's Sherman Oaks or Sunland-Tujunga - do not have a voice. And, that is manifested in land-use decisions, in transportation decisions and a sense they are not getting their fair share." So it seems - we are back to an "us against them" situation. Our grass-roots community up against the elected candidate failing to listen to us and not working effectively to adopt the priorities of the people. If you are one of the many fed up constituents who have hit a brick wall with Krekorian and his staff, you are not alone. 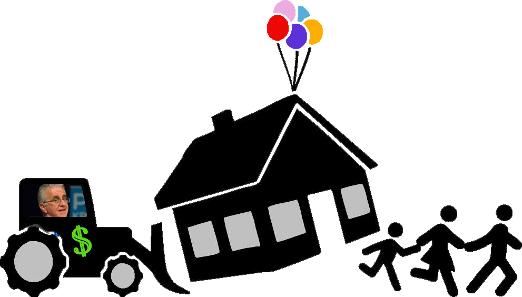 If you are tired of developers taking over your street and your neighborhood, developers who have been granted variances, exemptions, indemnification from local plans and laws . . . you are not alone. 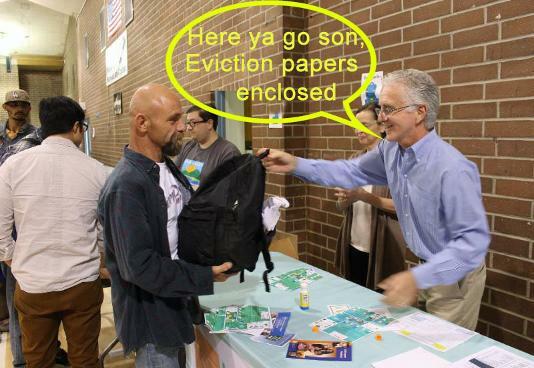 If you have come to learn how Councilmember Paul Krekorian loves to talk a good talk in front of the camera but fails to walk the walk. . .you are not alone. If you are unaware of the corruption currently taking place in the office of Council District 2, there is a wealth of information to be learned that will be jaw dropping. If you are fed up and have had enough, please speak your voice and connect with us. 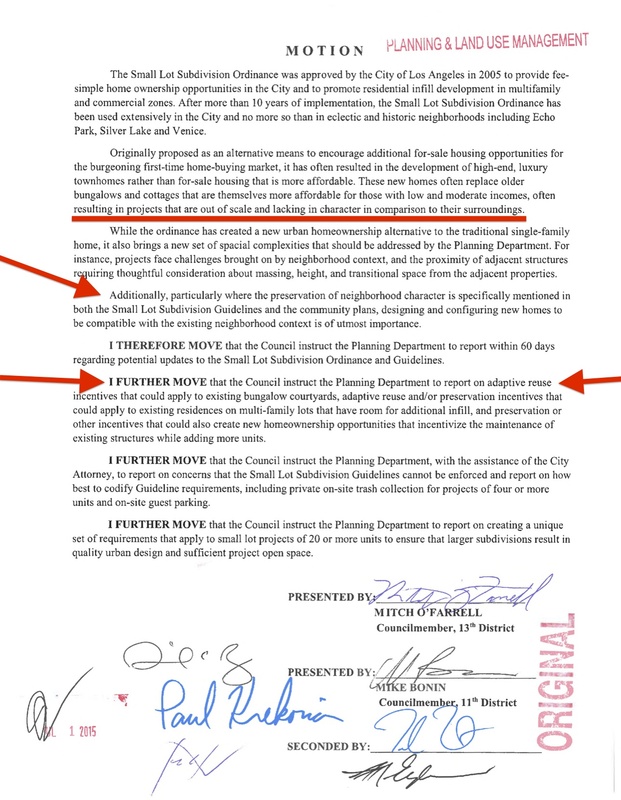 saveValleyVillage and its members are not declaring their support nor their opposition to the CD2 Petition to Recall. They are simply being used as a valuable source of information that should be made available to the public. 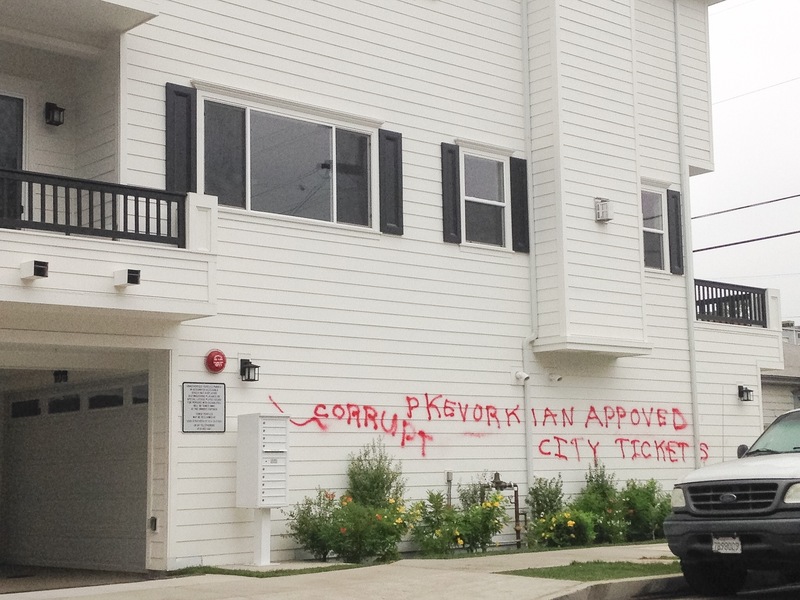 This picture was taken OUTSIDE of Krekorian's district. Even citizens living and working outside Council District 2 have had enough.